The What: The latest update for Martin Professional’s M-Series consoles, v3.0, is now available. Martin’s v3.0 Software features new touch and gesture optimization while the upgrade allows consoles to become a real PC-based controller. The What Else: The new v3 software offers faster start-up time, show loading and more efficient access to functions. The user-interface has been optimized for touch and gesture technology, which allows the user to work in an environment where everything is accessible from a single touch. Users can swipe to move from view to view, access other playback banks or change parameter selection. Double tapping on playback status accesses its functions and options. Additionally, users can enlarge the quick slide out for visual parameter control. Martin’s M-PC v3 is no longer a simple hardware emulator, but a real PC-based controller with a user-interface optimized for any Windows 7 or Windows 8 PC equipped with or without a touch screen. Using the same concept as the console interface, the M-PC v3 allows anyone to program shows for free. 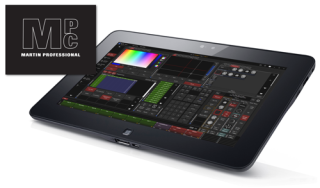 M-PC Free Edition is available for one universe over Artnet as well as the ENTTEC DMX devices. It is also possible to use the M-PC with two universes using any Martin Duo-DMX box. When using its One-Key dongle license, the universe count can be increased to 8 and even 64.